You should definitely try to bundle air, hotel, transfers or car rental and sightseeing activities together into one concise package using one of our preferred Tour Operators! 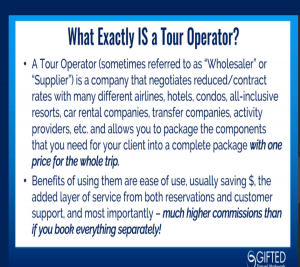 A Tour Operator (sometimes referred to as a “Wholesaler” or “Supplier”) is a company that negotiates reduced/contract rates with many different airlines, hotels, condos, all-inclusive resorts, car rental companies, transfer companies, activity providers, etc. and allows you package the components that you need for your client into a cohesive package with one price for the whole trip. So, be sure to familiarize yourselves with our preferred Tour Operators and get booking! Why It Is a Great Time To Work in Travel! What can I do to get family, friends and prospects to take my business seriously?